Take your own sweet time completing the 30 hours of studying required by the Colorado DMV. No backpack needed, because there are no books. And your chair can be as comfortable as you make it. 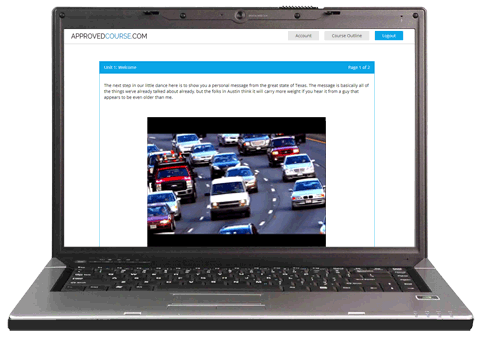 The entire course is online and video-based. How quickly or slowly you work is completely up to you. Chapters cover only one subject, minimizing confusion. The Whole Kit and Kaboodle - Online! How does being your own instructor sound? Well that’s exactly what you get with our online driver’s ed course for Colorado. You choose the schedule, and determine how you’d like to study, and where. Why spend countless hours in a boring lecture? We prefer to offer the course in a way that eliminates pressure, and does not get in the way of your busy social life! Simply sign up, and you will see the utter simplicity of earning your Colorado driver’s permit. Following the completion of each chapter, you will take a brief, multiple-choice quiz. If you are not satisfied with your knowledge, you may retake the quiz as often as you like. And the best news of all? You can take the final exam as many times as you need - you’re practically guaranteed to pass! It Won’t Get Any Easier Than This! As a teen, you are already busy! Texting, tweeting, snapping, and chatting take up most of your day as it is! When you add the dreaded expectation of school work, family time, and even a job, when do you have time to take driver’s education? With our course, it’s not a problem. No need to set aside a large volume of time - ever! You will set your own pace, schedule, and enjoy a quite flexible experience. With 24/7 access to our expert educators, you can do a lot or a little, and you are the one who decides which! Colorado Requirements For Online Driver’s Ed? CHECK! After completion of our 30-hour online drivers ed course, you will be eligible to receive your Colorado driver education permit, and again, you can do it at your own leisure. Be aware however, that your completion certificate is valid for only six months, and you must be 14 years and 10 months of age prior to beginning course work. Although we doubt you will fail any part of the quizzes and final exam, you are able to retake any and all of them until you pass, with no additional fees. Take note though, if you do not pass after the second attempt at the final exam, you will be required to brush up a bit more before you can retake the final for a third time. We’ll even provide a 50-item practice test that will cover the needed material to pass the actual DMV test. The test format simulates the actual DMV test model, and provides randomly selected questions to test your knowledge. If you’re really in for a challenge, you can upgrade to the 100-item test and rest assured that you are adequately prepared for your DMV exam. We are here for you 24 hours a day, seven days a week. If you have questions or concerns, you are no more than a phone call away from speaking with an expert that can help you through. If you prefer, you can communicate via email. We’ll provide you with answers to your questions, no matter what time of day or night you have them. No need to wring your hands while your teen prepares to get his or her driver’s license. We will guide them through every part of gathering and remembering the information needed to be a qualified, and safe driver in the state of Colorado. .
We’ve even included a unique parent-teen driving contract so you can be directly involved in the expectations of your teen as he or she learns to drive. We want this to be a positive experience for you as well! Getting Your License Couldn't Be Easier!